Meeting at the Border Pass Kunya Urgench/Hojeyli at 10.00 AM (Turkmenistan side of the border). Border passing formalities. 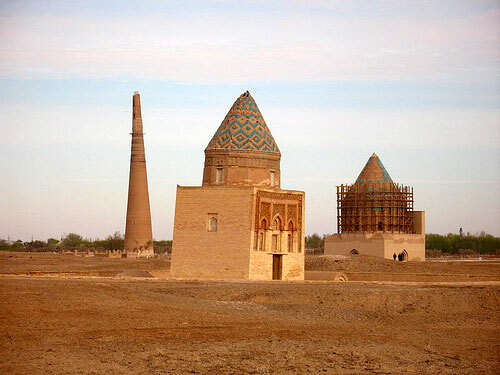 Drive to Kunya Urgench - the capital of Khorezmshahs (III-XVI cc) (It is 18km and takes 20min driving). SS of the old city includes: Portal of Caravansaray (XI-XIV), Mamun Minaret (X-IX), Il Arslan Mausoleum (XII), Sultan Tekesh Mausoleum (XIII), Academy of Horezm (III-XIII), Kutlug Timur Minaret (XIV) - one of the tallest minarets in Central Asia, Turabek Hanum Mausoleum, Mausoleums of Najmeddin Kubra (XIII) & Soltan Aly (XV), Local Museum of Kunya Urgench located in the building of XIX cc medresse. After SS proceed to Dashoguz (It is around 110 km and takes about 1,5 hours driving). Upon arrival transfer to the airport of Dashoguz to catch an evening flight to Ashgabat. Type of Aircraft Boeing 717-200. Flight T5-104. Departure at 19.00 pm & arrival at 20.00 pm (flight time & costs are subject to be change). Upon arrival transfer to hotel. Accommodation & rest. Half Day SS of Ashgabat includes: Ashgabat's famous Oriental Bazar - Jygyldyk (Tolkuchka in Russian - open on Thursdays, Saturdays & Sundays) where it is sold almost everything: camels (only on Sundays), carpets, cars and etc. where is possible to find plenty of souvenirs such as carpets, aladjas, handcrafts, felts, embroideries, jewellers and etc. It is also one of the best places to meet face-to-face with Turkmen culture and people. After bazaar drive to Mary. (it is around 380 km and takes about 4,5 hours driving). En route stop to visit the ruins of Medieval Bagabat Town, Anew Mosque, Museum of Agriculture " Ak Bugday", Abiverd Medieval Town Ruins & Kone Gala. Arrival & accommodation. Drive to visit Margush Country (Gongur Depe - capital of Margush) - Bronze Age Civilization Sites & Birthplace of Zoroastrism (IV-III mil. BC-VI BC). (It is around 90 km and takes about 2 hours driving. 4WD is required). Lunch as a picnic. After SS of Margush drive back to Mary. 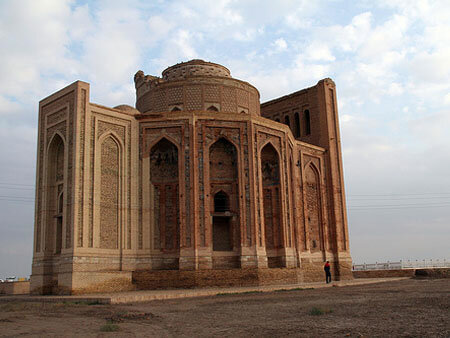 En route stop to have SS of Old Merv - inscribed into the monuments list of World Heritage Book, protected by the UNESCO: Gyz Gala & Oglan Gala (VI-VII), Complex of Askhabs (VIII-XIV), Giaur Gala (IV BC), Buddist Complex (IV-VI), Beni Makhan Mosque-first Mosque build in Central Asia (VII), Erk Gala (VI BC), Soltan Gala (XI), Soltan Sanjar Mausoleum (XII), Ibn Zeid Mausoleum (XII). After Old Merv transfer to the airport of Mary to catch an evening flight to Ashgabat. Type of Aircraft Boeing 717-200. Flight T5-130. Departure at 19.30 & Arrival in Ashgabat at 20.10. Upon arrival transfer to hotel. Accommodation & rest. Full Day SS of Ashgabat includes: New Park dedicated to Akhalteke horses - the pride of Turkmen, Arch of Neutrality, Presidential Square, Gulistan Bazar, Monument of Lenin which was erected in 1927 and survived the earthquake of 1948, Ertogrul Ghazy Mosque, Turkmenbashynyn Ruhy Metjidi which is biggest in Central Asia & Mausoleum Complex of the tombs of Turkmenbashy and his parents with his brothers, Old Nissa - The Sanctuary of Parhian Kings (Nissa is situated in 15 km to the west of Ashgabat & founded in the III century B.C. Nissa was the capital of Parthian Empire which lasted for about 600 years and was the biggest competitor for the Rome Empire. 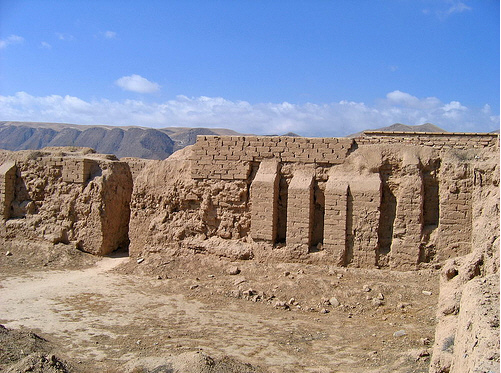 Here there were the palace & temple buildings, the depositories & the treasury of the Parthian Kings. During the Old Nissa excavations the monumental constructions are exposed-the temples (round & tower). 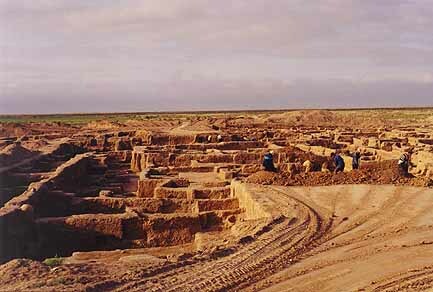 Taking into consideration the great scientific-cultural meaning, the site of the ancient town is declared the historical-cultural preserve. Recently it was inscribed at the World Heritages Book by the UNESCO. 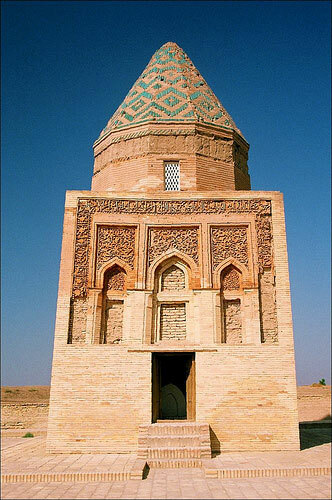 ), Health Path of Turkmenbashy built on the mountains, National Museum of History & Ethnography for extra entry cost paid directly (it is highly recommendable to visit that museum after an Old Nissa excursion), Monument of Independency & Ruhnama. Early Morning transfer to the airport of Ashgabat to catch a flight home.